Pattada™ G-10 Black - Spyderco, Inc. Page 983 – Spyderco, Inc. The Pattada is a member of Spyderco’s unique Ethnic Series of knives—an ongoing project that recognizes and pays tribute to the world’s distinctive cultural cutting tools by expressing them in modern form. This unique knife draws its name from the cutlery capital of Sardinia, an autonomous region of Italy and the second largest island in the Mediterranean. There, a traditional style of folding knife called a resolza has been made for generations. Also commonly called a Pattada because of its place of origin, this do-everything cutting tool is an integral part of everyday Sardinian culture. 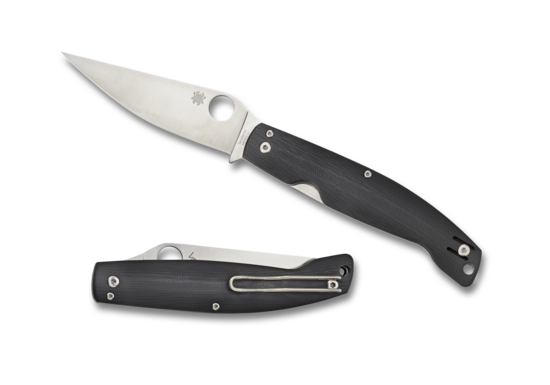 Spyderco’s expression of this remarkable knife takes the classic lines and timeless styling of the original and faithfully renders them using state-of-the-art materials and manufacturing methods. The iconic Pattada blade shape, characterized by a straight clip point and long curved cutting edge, is faithfully executed in premium N690Co stainless steel. Its full-flat grind and PlainEdge™ cutting edge ensure superior edge geometry and low-friction cutting performance. The blade is paired with a gracefully curved handle built with full stainless steel liners and painstakingly machined contoured G-10 scales. The handle’s liners provide exceptional strength and also form the foundation of the knife’s sturdy LinerLock mechanism, which locks the blade securely in the open position. A non-traditional, but highly functional, deep-pocket wire clip supports ambidextrous tip-up carry and keeps the Pattada poised for immediate access.